When you talk about counties of Ireland-Antrim northern Ireland has some of the must see and must do attractions in Ireland including sampling one of the best Irish whiskey brands along with some of the finest coastal scenery in the world, found along the Antrim Coast Road. See highlighted places below here for tips on places to visit in County Antrim if you are planning any Ireland tours and are looking for some things to do while you are here in Ireland. It is one of the six Northern Ireland counties in the UK and one of the 32 counties of Ireland. In terms of its northern Ireland facts it has a population of just over 600,000 people and is situated in the North East of Ireland. Ballygally Castle in County Antrim northern Ireland, currently a hotel owned by a major chain, is allegedly one of the most haunted places in the country. Lady Isobel Shaw, whose husband built the castle in 1625, is said to knock on doors at night and then disappear. While alive, Ms. Shaw was locked in her room by her husband and starved, until she leapt to her death from a window. Did you know that Lough Neagh near Antrim, with a surface area of roughly 150 square miles,is the largest lake in the British Isles. The only French Victory on British soil in the modern era occurred in 1760 at Carrickfergus when a French commander called Thurot captured the town. The Giant's Causeway was formed as the result of three lava flows. 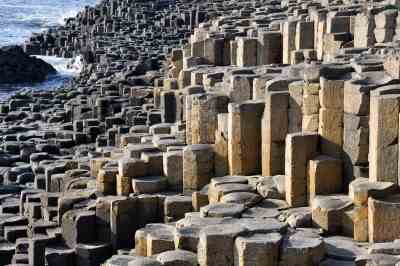 Approximately 40,000 hexagonal columns were formed when molten lava met the sea water. There are several interesting formations such as the 'Giant's Chair', 'Giant's Organ' and the 'Wishing Chair'.It is a popular tourist destination. Near Ballycastle is a lake called Loughareema. Loughareema translates as 'The Vanishing Lake'. This lake is on chalk over peat as a result of which the lake fills up during wet weather when streams come down the mountain into it. During dry weather the water seeps down through the chalk and only the dry bed of the lake is visible. The highest mountain in Co. Antrim is Trostan at 1817 ft. followed by Knocklayd (1695), Divis (1574), and Slemish (1457). The Antrim Hills run from north to south and while the inland slope is quite gradual the coastal side is almost a sheer drop to the sea. Between the hills and the sea runs the Antrim Coast Road with spectacular views. Carrick-a-Rede is a rope bridge which connects the mainland with the small Carrick Island. Originally, over 300 years ago it was for the benefit of salmon fishermen and consisted of single planks of wood with a rope handrail. Salmon fishing is no longer practised and a new modern bridge has been installed and is a tourist attraction. 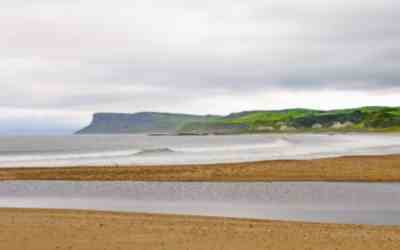 The Causeway Antrim Coast & Glens in County Antrim northern Ireland has as they say here a list the length of your arm! It’s unlikely you’ll manage to get around them all on your first trip, but that is a great excuse for coming back! This rugged seaboard has some of the most beautiful pictures of Ireland and coastal scenery (a friend of mine said stress relief if you are not driving) but please pack your walking your boots as well as your camera – it’s an outdoor most beautiful scenic adventure that offers challenging coastal walks and even extreme rock-climbing on the 100m- high crags of Fair Head. It’s also home to the North’s best surfing breaks. 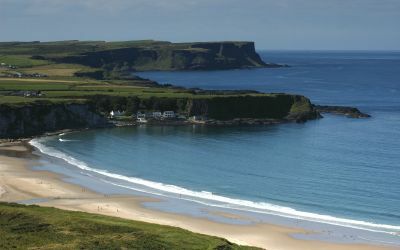 The Antrim Coast Road route is an odyssey of astonishing natural landscapes, from patchwork hills, mountain streams and waterfalls to a dazzling coastal road with majestic cliffs, golden sands and the unique glory that is the Giant's Causeway where 40,000 mainly six-sided basalt columns create an eerie landscape jutting into the ocean. The world famous Giants Causeway Northern Ireland in County Antrim Ireland one of the top Ireland tourist attractions and is renowned for its polygonal columns of layered basalt, formed from a volcanic eruption 60 million years ago, is the only World Heritage Site in Northern Ireland and is a must see for visitors. The World Heritage Site of the Giants Causeway northern Ireland is situated on the North coast in County Antrim (two miles north of Bushmills, 11 miles from Coleraine and 13 miles from Ballycastle) within the Causeway Antrim Coast, an Area of Outstanding Natural Beauty. On arrival to the site, you will be greeted by the impressive new Giants Causeway Visitors Centre which rises and blends into the landscape, with walls of glass, basalt columns and offers breathtaking views of the coastline from the grass roof. The building was designed by award winning architect Heneghan-Peng and has achieved a BREEAM ‘Excellent’ award for sustainability in design, material, energy, construction management and ecology. This is in the running for the best Irish whiskey! What would the other front runners be? Well Powers Irish Whiskey and Jameson Irish whiskey would be another two. 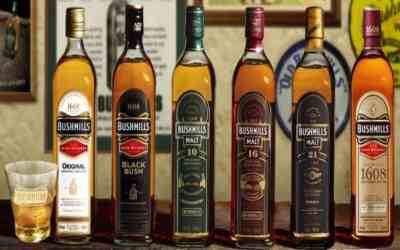 Bushmills is one of the top whiskey brands in the world without a doubt and this great old Bushmills distillery is located in Bushmills in County Antrim. So when you are here be sure and take a trip to the famous Bushmills in County Antrim northern Ireland and taste the best whiskey brands at Ireland’s oldest working distillery, situated close to the Causeway Antrim Coast Road. Watch the best Irish whiskey making take place, and enjoy a wee taster too, as the secrets of 400 years of distilling at the home of Bushmills Irish whiskey is unlocked. They say that the Attractions of the North Coast Coastal Route scenery are the reason for the tourists. We think its because one of the best Irish whiskey brands are here and the attractions of the north coast are a great excuse! There are several resort towns in County Antrim Northern Ireland along the coast including Portrush (with well-known golf links just after hosting the Irish Open in 2012), Portballintrae and Ballycastle; on the east resort towns in County Antrim include Cushendun, Cushendall and Larne on the Sea of Moyle, and Whitehead on Belfast Lough. All are somewhat exposed to the easterly winds prevalent in spring. Few people come here, so it's peaceful. The views are spectacular with lush green hills rolling down to the sea. On the left, Fairhead soars into the sky, with Rathlin Island peaking around the corner. You may never see a more beautiful site than Murlough Bay. Rathlin Island is just off Ballycastle, County Antrim northern Ireland. We highly recommend to take the ferry from the beautiful port in Ballycastle and amidst the rugged landscape of this isolated island, you can let your mind wander, admire the puffins and discover a tranquility and beauty that is so unexpected. Maybe Northern Ireland's best kept secret! Famed in poetry, song, myth and magic there are nine Glens of Antrim northern Ireland, each endowed with an evocative name and each weaving its own special magic.Lush, green secret places with the sound of water alternately softly swirling, then falling in dramatic torrents, the nine Glens of Antrim delight the senses. Entwined with their rich beauties are equally diverse and magical stories, combining the colourful history, myth and the traditions of the communities within the glens. Glenarm - The glen of the army, with Glenarm village, eleven miles north of Larne, on the famous Causeway Coastal Route. Glencloy - The glen of the hedges, two miles north of Glenarm, in Antrim northern Ireland with the village of Carnlough at its foot. Glenariff - The arable or fertile glen, the best-known of the nine as the 'Queen of the Glens', sweeps majestically towards the village of Waterfoot. Glenballyemon - Edwardstown glen, at the foot of which is Cushendall - more of less at the centre of the nine glens. Glenaan - The glen of the colt's foot or rush lights, a rugged glen - having the site of the legendary Ossian's grave, with the Cushendall-Ballymoney mountain road. Glencorp - The glen of the slaughtered, close by Glenaan and roughly parallel to the main road from Cushendall to Cushendun. Glendun - The glen of the brown river, adjacent to Cushendun village; spanned by a viaduct on the main Cushendall-Ballycastle road. Glenshesk - The sedgy glen, east of the town of Ballycastle, and sweeping towards the ruins of historical Bonamargy friary. Glentaisie- Named after 'Taisie', princess of Rathlin Island, roughly west of Ballycastle and, like Glenshesk, close to the town. 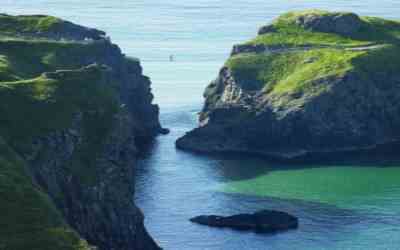 Carrick-a-Rede in County Antrim northern Ireland boasts unrivalled coastal scenery and an exhilarating rope bridge experience accessed by a short coastal footpath. On the way, there are wonderful vantage points to stop and take in the natural beauty. Lough Neagh in Antrim northern Ireland is the largest lake in the island of Ireland. It is 5 minutes from antrim town if you are there shopping, take a stroll around Lough Neagh and savour the the most peaceful place for miles.There is a full walk right around the water amid a lovely nature reserve, theres a lovely wee cafe that serves delicious coffee and also snacks etc. Belfast Zoo is one of the top fee-paying visitor attractions in Antrim northern Ireland, receiving more than 300,000 visitors a year. Located in north Belfast, Belfast Zoo 55 acre site is home to more than 1,000 animals and 150 species. The majority of the animals are in danger in their natural habitat. Belfast Zoo also carries out important conservation work and takes part in European and international breeding programmes which help to ensure the survival of many species under threat. It is home to one of Northern Ireland's most iconic native species, the red squirrel. Taisie, Shesk and Oisin arrived at Belfast Zoo in 2012 and have moved into red squirrel nook, a new interactive and educational exhibit. They will form the first NI breeding project for this species. The capital city has a full page of attractions at Belfast Tourism page.